On 26 August 2016, a 43-year old worker was injured and killed as a result of the explosion of an oxygen gas tank at the Astraviec nuclear power plant (NPP) construction site. This death was the latest in a series of accidents which have already started to raise nuclear safety concerns, both domestically and internationally. In July 2016, the Belarusian media reported another dangerous incident which occurred during the installation of a reactor. It also turned out that the NPP's management had been concealing this news for more than two weeks. This lack of transparency is reminiscent of the suppressed news of the Chernobyl catastrophe back in 1986. As a result, NPP construction has come under closer scrutiny and even the state-run media picked up the topic of nuclear security. However, all these events have not led to massive anti-nuclear protests in Belarus. Reports of incidents at the Astraviec construction site have been piling up in 2016, bringing more and more attention to the first Belarusian nuclear project. For instance, in April 2016, Poland-based TV channel Belsat reported the collapse of a supporting structure in one of the maintenance buildings on the site. Despite the fact that an employee tipped off journalists, the NPP management responded by denying that the accident had even taken place and referred to the news as “absolute nonsense.” Later, the Belarusian Ministry of Energy nevertheless confirmed the accident, trying to downplay its severity. Less than two months ago, authorities tried to conceal another, more serious accident which interrupted the installation of the nuclear reactor. On 10 July 2016, the reactor casing, weighing over 330 tonnes, reportedly fell to the ground from a height of 2 to 4 metres. However, the wider public became aware of this disaster only on 25 July. Local anti-nuclear activist and United Civil Party member Mikalai Ulasevich reported that more than ten anonymous insider sources could confirm that something went wrong during the test lifting procedure. The Belarusian media immediately tried to obtain confirmation, but did not receive a response either from the NPP management or the Ministry of Energy. The latter released a statement only in the late afternoon of 26 July. It merely confirmed the accident, assuring the public that it would prioritise the “absolute safety”of the NPP. By that time, even the Belarusian state-run media started to question nuclear safety, asking the Ministry of Energy inconvenient questions. For instance, a major official Belarusian TV channel inquired if the ministry had planned to inform the public of accidents at the NPP at all, or if they only admitted to problems because of the leaks and whistleblowers. Journalists also doubted Rosatom's credibility, implying that an outside contractor was more interested in doing business than dealing with the NPP in the long term. Belarusian environmentalists had already adopted a clear anti-nuclear position by 2005, when officials started mentioning plans for an NPP. In 2006, the Belarusian NGO Ecodom, backed by the opposition parties, pioneered an organised anti-nuclear movement. By 2008, major anti-nuclear initiatives united within the Belarusian Anti-Nuclear Campaign. However, Belarusian authorities did everything possible to neutralise the dissenting green movement. For instance, during the so-called public debates on the NPP construction in October 2009, only a few anti-nuclear activists were allowed to attend. The event ended with the arrest of anti-nuclear expert Andrei Ozharovskii. Moreover, the Institute of Sociology at the National Academy of Sciences produced surveys indicating a surprising turn in public opinion towards acceptance of nuclear energy. While reportedly only 28 per cent of Belarusians supported the construction of the NPP in 2005, in 2016 this figure grew to 50.3 per cent. At the same time, the number of opponents decreased from 50 to 17.3 per cent. Environmentalists criticised these surveys as unreliable and biassed, as apparently researchers from the Institute of Sociology put pressure on the respondents to answer "correctly." Survey participants were not anonymous and faced psychological pressure, as they had to disclose all personal information in questionnaires. Finally, authorities used the “divide and conquer” tactic against environmentalists by supporting loyal NGOs with a clear pro-nuclear agenda. For instance, Ecological Initiative has been actively cooperating with the authorities and promoting nuclear energy. In September 2012, this NGO acted as one of the founders of the Public Information Centre to monitor environmental safety at the Astraviec NPP. What's more, Ecological Initiative's chair, Yury Salaueu, used to hold a top management position with the pro-regime Belarusian Patriotic Union of Youth. Moreover, the experts of this NGO happen to work for the Institute of Nuclear Physics at the National Academy of Science of Belarus, one of the institutions immediately involved in the NPP construction. 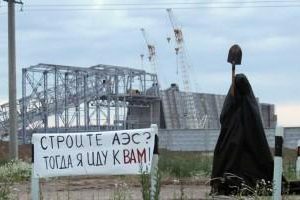 Even though in 2016 the anti-nuclear movement has captured more attention, environmentalists fear that Belarusian society is dangerously naive when it comes to NPP construction. According to the coordinator of the Green Network association, Yaraslau Bekish, this explains why even serious accidents in Astraviec have not catalysed significant public protests. So far, Belarusian authorities have succeeded in protecting their pet project in Astraviec. Neither Belarusian independent anti-nuclear activists nor the EU have the leverage to interfere in these plans. However, there is a chance that their voice could be heard if such emergencies and accidents continue in the future. In July and August, Belarusian diplomats kept busy reinforcing ties with the country’s partners in Central and Eastern Europe. These relationships may prove to be instrumental in bolstering Belarus's foreign policy positions. Foreign minister Vladimir Makei travelled to Kyiv in the midst of another flare-up in the conflict between Russia and Ukraine. His deputy Alena Kupchyna's trips to Austria, Poland, Turkey and Ukraine served to strengthen informal channels of communication alongside formal contacts. At home, Belarus has started preparing intensively for its 2017 presidency of the Central European Initiative, hoping to reap important economic and PR benefits from this temporary office. Vladimir Makei visited Ukraine on 25-26 August for the inauguration of the new residential compound of Belarus’s embassy in Kyiv. The foreign minister paid a visit to the country’s President Petro Poroshenko and discussed a wide range of issues with his counterpart Pavlo Klimkin and deputy prime minister in charge of construction Hennadiy Zubko. Makei visited Kyiv just as Minsk’s closest ally, Russia, was accusing Ukraine of terrorism and had once again started referring to Ukraine’s leaders as “those who seized power in Kyiv”. Lukashenka’s emissary emphasised Belarus’s determination “to be guided only by its own national interests” when developing its relations with Ukraine. Belarus and Ukraine are happy about the absence of “any unresolved issues” in their bilateral relations. Makei dismissed recurring trade wars as “periodically emerging minor questions” of “mostly technical nature”, which the countries intend to address at the next meeting of the intergovernmental committee. Makei and Poroshenko discussed the prospects for further normalisation of relations between Belarus, the EU, and the United States with Ukraine’s assistance. In July, meanwhile, Belarus’s foreign ministry had politely declined a similar offer from Poland’s foreign minister. Witold Waszczykowski then suggested that Warsaw could act as a mediator in fostering closer cooperation between Belarus and NATO. Belarusian and Polish diplomats may have discussed Waszczykowski’s mediation proposal within the framework of political consultations held in Warsaw on 20 July. The delegations were headed by deputy foreign ministers Alena Kupchyna and Marek Ziółkowski respectively. Minister Waszczykowski, who received Kupchyna in Warsaw, rejoiced at the increasing dialogue between various ministries in each country, but mentioned political and parliamentary contacts specifically. Indeed, two weeks later, Ryszard Terlecki, vice-speaker of the Polish Sejm, led the highest-level parliamentary delegation of an EU country to Minsk in twenty years. The accommodating Polish government seems to be willing to negotiate, advocating the improvement of the situation of the Polish minority in Belarus in exchange for recognition of the impotent Belarusian parliament. However, summer seemed to be more conducive to informal contacts between Belarus and Europe. Alena Kupchyna went to Kyiv on 11-12 July to attend the 7th Eastern Partnership (EaP) Informal Partnership Dialogue. The EaP countries’ senior diplomats discussed the further development of the Eastern Partnership and international issues. Their colleagues from the ministries of economy focused on economic reforms to unleash the potential of small and medium-sized enterprises. Kupchyna seized the opportunity to campaign for an enhanced dialogue between the Eurasian Economic Union (EAEU) and the European Union. Belarusian diplomats are persisting in advocating the “integration of integrations” despite the fact that even sympathisers of this concept in the EU see it as a mere Russian project. On 27-30 August, Alena Kupchyna travelled to Alpbach (Austria). She participated in a panel discussion on Central and Eastern Europe and Russia in the framework of the European Forum. In Alpbach, Kupchyna met in an informal setting with foreign ministers of Slovakia and Ukraine. The soon-to-be Belarusian ambassador in Vienna also held meetings with the Austrian foreign minister and some members of his staff. Alena Kupchyna visited Turkey on 15 July, only one day before the failed coup attempt. In Ankara, she held political consultations with Deputy Undersecretary Ali Kemal Aydın. Belarus and Turkey agreed on an action plan to develop cooperation between the two countries for 2016-2017. The trip's main purpose was to prepare for President Recep Tayyip Erdogan’s visit to Minsk, which was initially scheduled for 29 July. The attempted coup forced the parties to postpone the visit. The recent crisis in relations between Russia and Turkey caused by the downing of Su-24 jet fighter never affected the dynamics of cooperation between Minsk and Ankara. Belarus expressed immediate and unconditional solidarity with Erdogan after the coup attempt. Belarusian President Alexander Lukashenka sent a personal message of support to his Turkish counterpart. Lukashenka's ideology boss, Vsevolod Yanchevskiy, visited Ankara on 11 August to discuss major investment projects, which would require the blessing of the two presidents. Minsk expects Erdogan sometime in September. The exact date has yet to be officially announced. As Belarus Digest had forecast earlier, Belarusian diplomacy intends to make the most of the country’s presidency in the Central European Initiative (CEI) in 2017. In Bosnia and Heregovina in June, Vladimir Makei promised to “place a special emphasis on fostering connectivity in the region, supporting sustainable economic development, and further promoting the CEI’s outreach”. By the latter, the foreign minister had in mind a closer relationship between the CEI and Russia-dominated groupings, such as the CIS and the EAEU. On 15 July, Makei began proper preparations for a series of CEI events to be held in 2017 in Minsk, one of the priority topics for his annual meeting with Belarusian ambassadors. More importantly, on 25 July, the Belarusian government established an inter-agency working group to ensure Belarus’s presidency of the CEI. The group was chaired by Prime Minister Andrei Kobyakov, and included high-level representatives of twenty-three ministries, governmental agencies and other public bodies. Having good qualifications for multilateral diplomacy, Belarus’s foreign ministry will seize every opportunity the presidency provides to push through its agenda with countries of Central and Eastern Europe. This region already represents the Belarusian authorities’ largest support base in Europe. Besides practical benefits derived from development of economic ties, the Belarusian government will try to use this opportunity to improve its public relations. Belarus’s growing engagement with Central and Eastern European countries may pursue two objectives simultaneously. Firstly, to position itself as an important regional player. Secondly, to obtain more and stronger allies or at least sympathisers among EU members and EU-leaning countries to strengthen its negotiating position with regards to the European Union.